Like many people, I knew nothing about painter Johannes Vermeer until I saw the film Girl with a Pearl Earring in 2004. I saw it for Colin Firth, not for the painter. It's a stunningly beautiful film (even if Scarlett Johansson is boring) and, while the plot is mostly conjecture, the story is not improbable. I've been meaning to read the book on which it was based since I saw the film. Six years later, I've finally had the chance to do so. And it doesn't disappoint. As with almost anything you could name, the book is better than the film. There's more emotion and subtlety than even the most magnificent and learned artistic directors can provide for a film. And it's beautiful. The text is rich without being overbearing - Ms. Chevalier has a real gift for metaphor, which is proved from the very first page. And it is those first metaphors that really call to the reader and beckon them onto the path of the novel. On top of this, Chevalier colors her story with a modern and realistic sense of honesty. This is not a story where everyone lives happily ever after, nor is it a story where the destitute rise up, put on a good show, and then crumble at the feet of the rich. The author has no time for such generalizations - she is so focused on the confirmation of each character's dues. It may be a novel she's written here, but it's also a history and therefore must be more realistic and end with more than a simple deserved comeuppance. 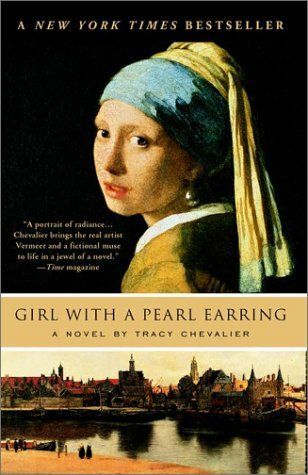 There's a lot of talent in this novel, and only some of it belongs to Johannes Vermeer. I definitely look forward to seeing what else Tracy Chevalier can do. So, do you suggest I see the movie, then read the book or skip said movie and go straight to le novella? Well, like I said Colin Firth is delicious, but Scar-Jo is boring, so watching her *after* the novel might come as a disappointment. I would watch the film and then pick up the book.